If you’re keeping track, when this training session started I knew next to nothing about forklifts and now that we’re entering Part Five of the on-line portion I know about the Stability Triangle and I know what types of behaviors and situations will get myself or my co-workers hurt. All important stuff as far as I can tell. I’m feeling ready to get on a forklift and give it a shot, but I’m not quite there yet- there’s more safety to go over. This section covers the equipment on the lift like the emergency brake, neutral, how to safely lift a load, when the ignition should be on and off, and where the load should be positioned if the lift is running, and safe carrying height. As in the previous section, there is a lot of “death” talk. As in, “not following these procedures could severely injure (or kill) you or your co-workers.” This is very serious and very important and should be taken seriously and that point is made very clear. 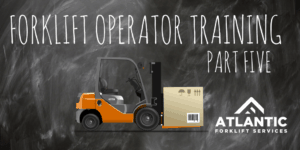 If you’re not willing to take this training seriously then you are likely not willing to take it seriously when you are actually at the wheel of a forklift and there’s just no room for that in any facility. Stop here if you decide you just cannot abide by these procedures. Supplied with the knowledge I need to keep myself and the people I may come in contact with safe, I was ready to take the section-ending quiz. Like most of this stuff, the safety elements of the section are very much based in common sense. You know if you’re doing something stupid. So don’t do that. That’s the lesson here. Six out of six on the quiz. Moving on to the next section, just one more before I get to climb on board a forklift and now I’m actually getting excited about it. The next section is Inspection and Maintenance. Feel like you still want to give operating a forklift a shot? Give us a call. We’ll get you started.